San Diego International airport is enjoying record passenger numbers and several new route additions during 2018 are fuelling that growth. Those rising passenger numbers are forecast to continue for the foreseeable future and the airport is working towards expanding Terminal 1 by 11 gates, as well as adding a new roadway to ease some of the traffic congestion that passengers face in reaching San Diego International. But some community groups believe more needs to done to ease congestion on travel to the airport, with one local government official proposing the construction of a cable operated tramway. It could take some time to reach consensus on the best remedy for improving transit to the airport but overall, finding ways to accommodate growth is a good problem to face. San Diego International airport continues to chart promising growth as airlines continue to expand at the airport. The facility is working to refurbish and expand gates at Terminal 1 and build infrastructure to ease traffic from the airport, but it is difficult to meet the demands of all community stakeholders. The airport’s dilemma is a familiar one, however it benefits all stakeholders to ensure that San Diego remains a competitive airport on the strategic US west coast. San Diego handled 22 million passengers in 2017, which was a 7% increase year-on-year and the highest throughput the airport had recorded in nine years. From Jan-2018 to Sep-2018, San Diego International’s passenger growth jumped approximately 10%, to 18 million. Source: CAPA - Centre for Aviation and airport reports. 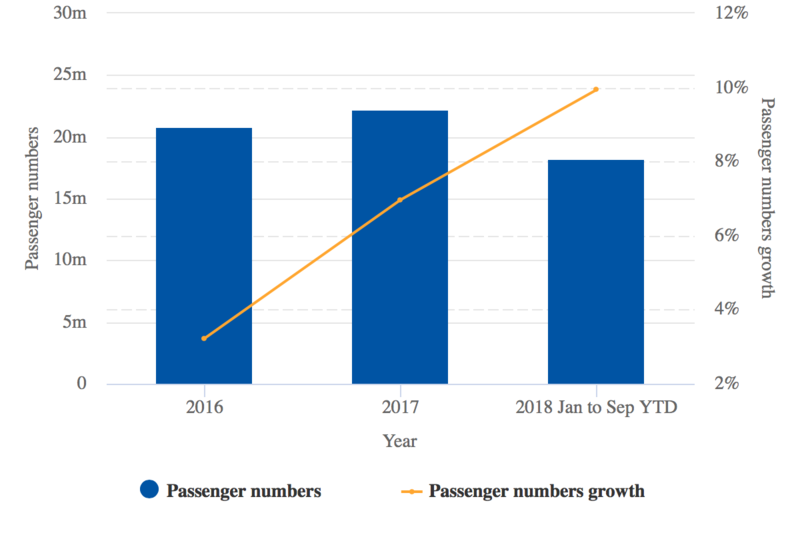 Year-on-year passenger growth at the airport has growth solidly each month in 2018, driven by increased seat growth and new route additions. The airport stated that Alaska Air Group was serving six new markets in Sep-2018 that it did not operate in Sep-2017, which resulted in the company carrying 21,468 more passengers year-on-year for the month of Sep-2018. The airline recently announced plans to launch service from San Diego to El Paso in Feb-2019. For Sep-2018 United had the largest increase in passenger numbers: 22,876. Southwest Airlines, which is San Diego’s largest airline measured by departing frequencies, expanded its passenger levels by 21,468 year-on-year in Sep-2018. 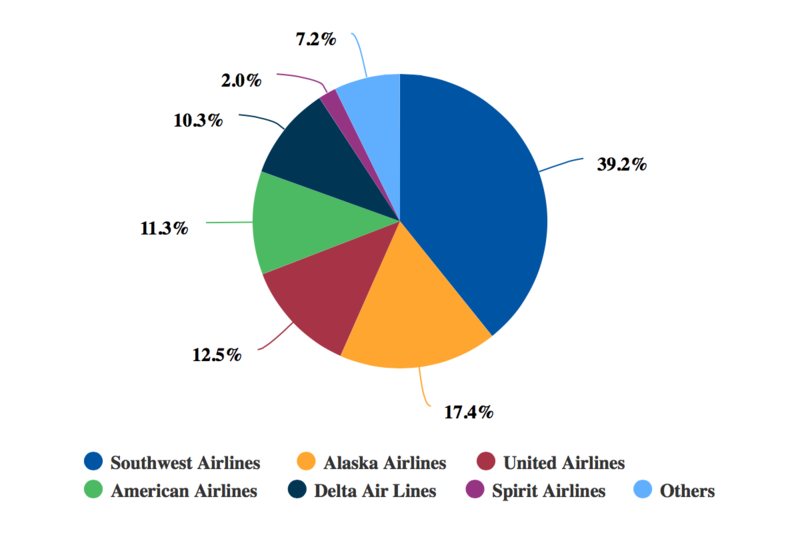 Southwest had a 38% market share in San Diego in Sep-2018, according to airport data. 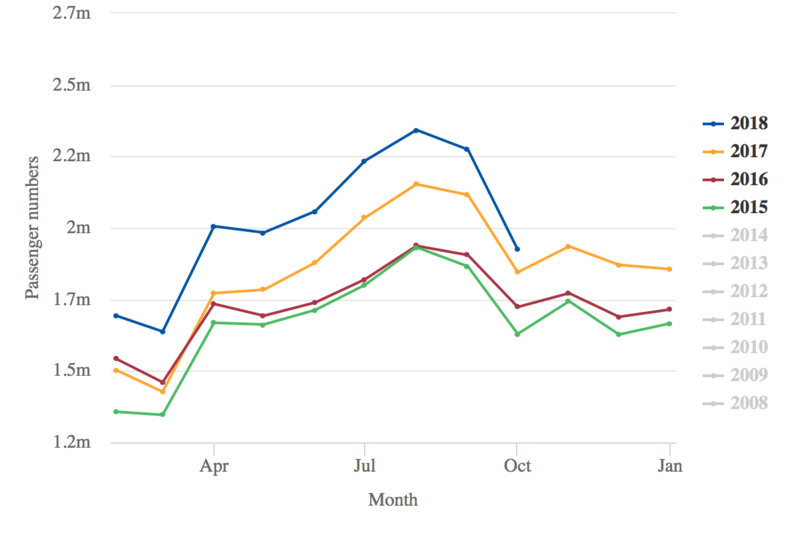 Hawaiian’s launch of service from San Diego to Maui in May-2018 resulted in the airline logging the fastest growth year-on-year in Sep-2018, at 38%. The airline also serves Honolulu from San Diego. Airport forecasts show seat capacity will grow 7.2% year-on-year in Oct-2018, 7.7% in Nov-2018, and 5.75 in Dec-2018. Forecasts cited by the San Diego Union Tribune project that San Diego International airport’s annual passenger levels could reach 28 million by 2035. More than a decade ago, in 2006, the region’s voters rejected a proposal to relocate the airport to Miramar, the site of a Marine Corps station. San Diego International has a single 9,000ft (2,750m) runway with tough terrain that has to be cleared. The approach from the east is steep, and some aircraft also have weight limits due to the climb rates required from the airport. Now the airport’s operator is working to spend USD3 billion in upgrades, including expanding the number of gates in Terminal 1 from 19 to 30 and a USD165 million elevated roadway to relieve traffic congestion to the facility, according to the San Diego Union Tribune. But community groups are voicing concerns about the potential traffic congestion generated by the airport’s expansion, despite the plans to alleviate traffic levels on the airport’s major thoroughfare. The Los Angeles Times has reported that San Diego county supervisor Ron Roberts has proposed an aerial tramway to connect passengers between the airport and the area’s convention centre, and other destinations in downtown San Diego. Mr Roberts’ office has commissioned a feasibility study of the skyway, and the publication stated that an aerial tramway following a route from the airport would cost USD230 million to USD300 million. The city’s Mayor’s office told the publication that the proposed skyway was one of several alternatives city staff and regional planners would be evaluating as it looked to invest in public infrastructure “that moves the most people at the highest and best use of taxpayer dollars”. San Diego’s situation is illustrative of the situation many airports in the US face as they attempt to balance community concerns about noise and automobile congestion against their need for expansion in order to remain competitive for expanding international and domestic air travel. The airport has aimed to start the overhaul of Terminal 1 in 2020, with a targeted completion date of 2023; however, airport authority officials told the San Diego Tribune that the airport was trying to understand the implications of comments on its environmental impact report regarding the USD3 billion refurbishment project, and it could potentially push off necessary approvals for the plan until after the end of 2018. As San Diego International airport works to balance the needs of all its stakeholders, the good news is that airlines continue to expand at the facility, and passenger growth is showing no signs of slowing down. The airport authority and all other stakeholders will continue working to find solutions to ensure that the necessary infrastructure is constructed to handle increasing passenger numbers in order for San Diego to maintain its competitiveness.